Specifications - Material: Forged S45C Steel - Length: 8in - Diameter: 0.275in Installation: - 1. Put the stake at a 60 degree angle with the ground, and keep the hook in the head of the stake facing the ground. - 2. Beat the stake with a tent hammer into the ground and leave about 1.5 inch height out. - 3. Fasten the tent rope into the hook in the head of the stake. If you have any questions about this product by JM-capricorns, contact us by completing and submitting the form below. If you are looking for a specif part number, please include it with your message. 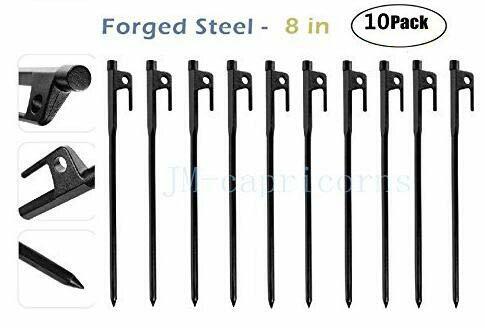 NTK Camping Tent Sand Anchoring Stakes, 10 pack Tent Pegs 10" Strong Hardened Galvanized Steel tent stakes with looped strings and 4 ABS Anchoring Disk Plus 4 Reflective Ropes for Outdoor Camping.